In school life, we were assigned to write or compose an essay about "Journey by Train" at times for preparation of our school examination. We taught or memorise this composition from our English essay book and put on in the answer script if it is appeared in the question paper. In these essays in the book there were dictated only the descriptions and benefits of journey by train. As it was described about pleasers of journey, descriptions of natural beauties from both sides of the running train or train line, descriptions of starting journey, departure of the train, the scenarios of the ongoing passengers, role of driver and the guard, the activities of station hawkers who were running street business in or near the rail station and at last returns to the last destination, received experiences, knowledge about the rail journey. The economic benefits, the role of railway in the economics and other developments were not so emphasised in these essays. But now-a-days, the "Journey by Train" beyonds many things and means from different corners. One of the best thinking about the railways is its role in our economy. Bangladesh Railway is the ancient and biggest institution from the late eighteenth century in the sub-continent. It is easy, hassle-free, cheap, comfortable, money and time saving journey of people especially for poor. Bangladesh Railway is contributing a great portion of national income in our GDP growth. But we get shocks when we hear the loss of Bangladesh Railway in its yearly financial statements disclosed in the public statement. There was a negative balance of payment in the financial statements of 2017-2018 financial year also according to different media; but why? Where all the countries of the world, developed or developing are reforming, updating and modernising their railway communications for the sake of their economic development, they are adopting and making new bullet train, sub-way and electric train for their smooth running or travelling from one place to another, for generating income, contributing to their national exchequer -- why we are lag behind to change or reform our this giant institution for our national interests? Our neighbours India and China are heavily investing and profiting from railway service. They are reforming administrative and financial management with bringing good governance in this sector by adopting latest technological developments suited to their needs. They are developing railroads, new rail connectivity and encouraging, attracting public and private investment in this sector. They are managing and developing their own railways, trying to connect with other countries via Rail for their own interests. Proposition of trans-Asian Railways is one of them. The world is now a global village and digital connectivity makes the nations more closer. Every country/nation wants to increase their export-import commodities' movement through diversified routes (highways, airways, waterways etc.) along with easy and cheap transportation media like Railway. The Railway is now the most important component and communication infrastructure which is vital for economic activities and development of a country. Present government has given priorities to develop this sector with great importance which is praiseworthy. It has taken various plans to extend and modernise this sector by setting-up Padma Bridge rail link, dual-gauge rail line (Akhaura-Sylhet), double railway line (Joydebpur-Mymensingh), 2nd Jamuna Railway Bridge, Dhaka-Chattogram double railway line, rail connectivity with India, Chattogram- Cox's Bazar railway line etc., initiative for electric speedy train, bullet train, railway circular-way around Dhaka city, metro-rail and underground railway for sound movement of the passengers. Government has also taken also pragmatic and visionary steps to bring railway network to all divisions and district town. Construction work of the 102 km Chattogram-Cox's Bazar Dual gauge track is going on in full swing. The rail line from Dohazari to Cox's Bazar which is expected to complete by 2022 will facilitate quick travel to the world's longest sea beach from the capital. It will help to gear up the tourism activities at home and abroad, and also generate revenue with a significant figure with cutting travel time from Dhaka by four hours. "Connectivity is productivity" in line with this proverb, we can say that "more railway connectivity will generate more revenue and income" for our nation. Neighbouring India, Nepal and Bhutan will also be connected to Cox's Bazar through the existing Dhaka-Kolkata rail route after the completion of the project. The rail line will facilitate travelling over 26,000 passengers everyday to and from Dhaka and Cox's Bazar. It will connect several Upazilas beginning from Dohazari to Cox's Bazar southeastwards. The rail line will be constructed from Cox's Bazar to Ghundom, Teknaf in the 2nd phase. 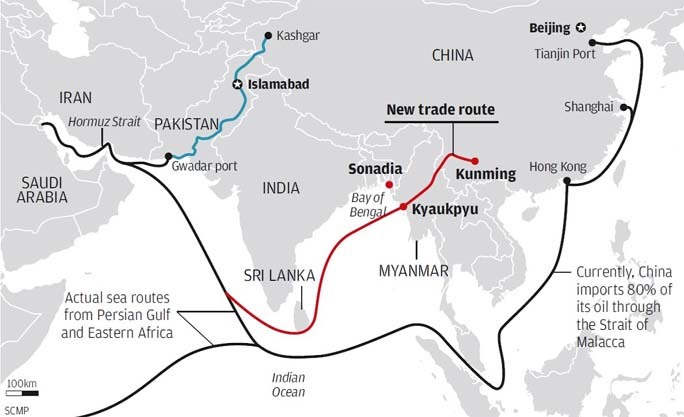 The new link will also is a part of the Trans-Asian Rail Route connecting Bangladesh with its neighbours including China, Myanmar and Thailand. Bangladesh Railway is our invaluable asset; we will have to be determined to make it profitable at any cost by bringing transparency in all parts of management controlling all corruptions, irregularities, wastage, misuse and mismanagement. We should be winner, gainer not loser.